Learning by doing is one of Pratt’s five teaching approaches. Bloom and his colleagues designated psycho-motor skills as the third domain of learning back in 1956. Learning by doing is particularly common in teaching motor skills, such as learning to ride a bike or play a sport, but examples can also be found in higher education, such as teaching practice, medical internships, and laboratory studies. In fact, there are several different approaches or terms within this broad heading, such as experiential learning, co-operative learning, adventure learning and apprenticeship. I will use the term ‘experiential learning’ as a broad umbrella term to cover this wide variety of approaches to learning by doing. Apprenticeship is a particular way of enabling students to learn by doing. It is often associated with vocational training where a more experienced tradesman or journeyman models behaviour, the apprentice attempts to follow the the model, and the journeyman provides feedback. However, apprenticeship is the most common method used to train post-secondary education instructors in teaching (at least implicitly), so there is a wide range of applications for an apprenticeship approach to teaching. Because a form of apprenticeship is the often implicit, default model also for university teaching, and in particular for pre-service training of university instructors, apprenticeship will be discussed separately from other forms of experiential learning, although it is really just one, very commonly used, version. Schön (1983) argues that apprenticeship operates in ‘situations of practice that…are frequently ill-defined and problematic, and characterized by vagueness, uncertainty and disorder‘. Learning in apprenticeship is not just about learning to do (active learning), but also requires an understanding of the contexts in which the learning will be applied. In addition there is a social and cultural element to the learning, understanding and embedding the accepted practices, customs and values of experts in the field. being unable or having difficulty in describing the knowing which their actions reveal. Pratt and Johnson further distinguish two different but related forms of apprenticeship: traditional and cognitive. A traditional apprenticeship experience, based on developing a motor or manual skill, involves learning a procedure and gradually developing mastery, during which the master and learner go through several stages. An intellectual or cognitive apprenticeship model is somewhat different because this form of learning is less easily observable than learning motor or manual skills. Pratt and Johnson argue that in this context, master and learner must say what they are thinking during applications of knowledge and skills, and must make explicit the context in which the knowledge is being developed, because context is so critical to the way knowledge is developed and applied. generalizing: learner and master discuss how well the model might work or would have to be adapted in a range of other possible contexts. articulate discussion and authentic participation in the realities of practice from within the practice, not from just one single point of view. Only from such active involvement, and layered and cumulative experience does the novice move towards mastery. The main challenge of the apprenticeship model in a university setting is that it is not usually applied in a systematic matter. The hope that young or new university teachers will have automatically learned how to teach just by observing their own professors teach leaves far too much to chance. The apprenticeship model of teaching can work in both face-to-face and online contexts, but if there is an online component, it usually works best in a hybrid format. One reason why some institutions are moving more material online in apprenticeship programs is because the cognitive learning element in many trades and professions has rapidly increased, as trades have required more academic learning, such as increased ability in mathematics, electrical engineering and electronics. This ‘academic’ component of apprenticeship can usually be handled just as well online, and enables apprentices to study this component when they are not working, thus saving employers’ time as well. For instance, Vancouver Community College in Canada offers a 13 week semester course for car body repair apprentices that delivers 10 weeks of the program online for unqualified workers across the province who are already working in the industry. VCC uses online learning for the theoretical part of the program, plus a large number of simply produced video clips of practices and procedures in car body repairs. Because all the students are apprentices already working under supervision of a master journeyman, they can practice some of the video procedures in the workplace under supervision. The last three weeks of the program requires students to come to the college for specific hands-on training. They are tested, and those that have already acquired the skills are sent back to work, so the instructor can focus on those that need the skills most. 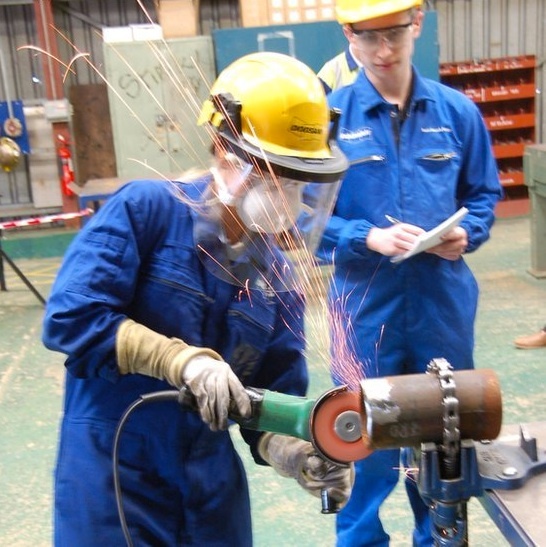 The partnership with industry that enables the college to work with ‘master’ tradespeople in the workplace is critical for this semi-distance program, and is particularly useful where there are severe skills shortages, helping to bring unskilled workers up to the level of full craftspeople. it acculturates learners to the values and norms of the trade or profession. in trades or occupations undergoing rapid change in the workplace, the apprenticeship model can slow adaptation or change in working methods, because of the prevalence of traditional values and norms being passed down by the ‘master’ that may no longer be as relevant in the new conditions facing workers. This limitation of the apprenticeship model can be clearly seen in the post-secondary education sector, where traditional values and norms around teaching are increasingly in conflict with external forces such as new technology and the massification of higher education. Nevertheless, the apprenticeship model, when applied thoroughly and systematically, is a very useful model for teaching in highly complex, real-world contexts. 1. Do you agree that learning to teach in a university depends heavily on an apprenticeship model? In what ways does it resemble apprenticeship and in what ways does it differ? In what ways could it be improved? 2. Do you agree or disagree that some elements of apprenticeship could be done just as well online as in class? if so, what would that be? 3. If you teach apprentices, do you think this section adequately describes the apprenticeship model of teaching? If not, what is missing? 3.5 Apprenticeship: learning by doing (1) by Anthony William (Tony) Bates is licensed under a Creative Commons Attribution-NonCommercial 4.0 International License, except where otherwise noted.